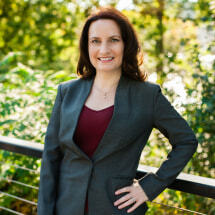 Amy joined Peterson, Berk & Cross, S.C., as an attorney in 2005. A graduate from the University of Wisconsin Law School, Amy practices in the personal injury section. Amy has tried many cases to verdict in multiple areas of personal injury law, including automobile accidents, dog attacks, premises liability and medical malpractice. Amy has also handled numerous appellate matters, appearing in the Court of Appeals of Wisconsin, the Wisconsin Supreme Court and the Seventh Circuit Court of Appeals. Amy has been selected for inclusion as a Rising Star in the Super Lawyers publication of Milwaukee Magazine. She is a member of the State Bar of Wisconsin, the Outagamie County Bar Association and the Wisconsin Association for Justice. Amy has authored articles and given seminar presentations on developments in case law and other legal matters. In addition to professional organizations, Amy has served as a board member for the Big Brothers Big Sisters of the Fox Valley Region and coached the Lawrence University Mock Trial Team. As a law student, Amy worked part time as a personal injury law clerk, served as Secretary to the Moot Court Executive Board, and was an Articles Editor for the Wisconsin Law Review. While a student at the University of Wisconsin-Madison, Amy played trombone in the Marching Band and Varsity Band. During her junior year, Amy studied abroad in Madrid, Spain, and she uses her foreign language skills in communicating with Peterson, Berk & Cross's Spanish-speaking clients in all of the firm's practice areas.